Last week I was contacted by a fellow BGG member from Alaska polling for people willing to trade a game for his freshly out of shrink copy of A Few Acres of Snow. The BGG software supports you creating a formal, expiring, offer to trade a game from your collection for a game in another user’s collection. If accepted, the two parties pay for their own shipping and on the honor system, simply mail the game. Given that it’s the honor system you’re taking some risk but the software also supports trade ratings and the ability to contact potential parties outside of the trade system. I usually contact the person directly, establish the current state of the game being traded, in my case, for only new or like-new games. As luck would have it and wanting a copy of A Few Acres of Snow, I shipped off my copy of Container (hadn’t seen the light of day in years), and when the copy arrived I tore into it. A Few Acres is a card-driven, two-player, battle game from Martin Wallace. 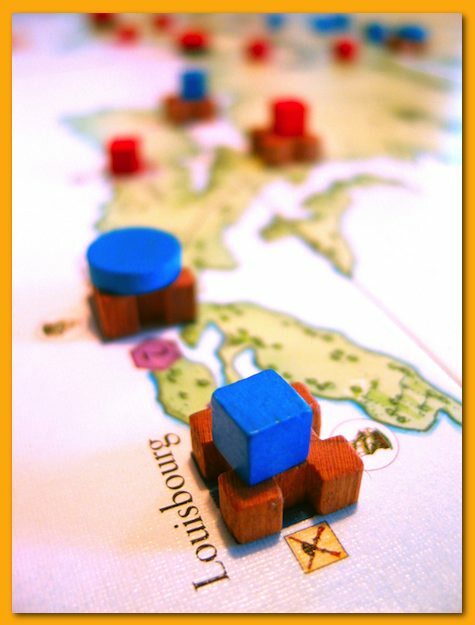 The game pits the French against the British for dominance in northeastern North America during the 1700s. The game uses a deck-building mechanic which is to say, players start with a fixed hand and then amass more cards throughout the game. Many cards serve multiple purposes depending on how they are played and many simply muddy up your deck. The first printing of Wallace games that come directly from TreeFrog are signed and numbered by Wallace himself and have premium components. I have two other games like this: Tinners’ Trail & Steel Driver. Unfortunately, the copy of A Few Acres is a 2nd printing and is not signed or numbered and has lower quality components. The 2nd printing fortresses are simply black discs and I decided, on a whim, to pimp out my copy with homemade bits that resemble the 1st printing fortresses. What you see in the image above is the end result. 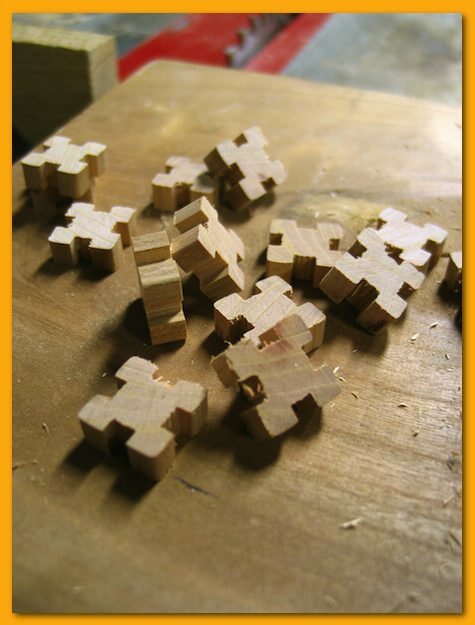 Below is an image of the bits while being made. Analog Game Night for February 2012 came and went several weeks ago. I’m striving to be more prompt in my blogging and rather than simply promising myself to do better in the future, I’m flushing my backlog of posts by sitting down and writing a little bit. It’s cathartic to chase the monkey off my back so to speak, and it’s good practice to attempt to organize my thoughts into semi-coherent sentences. Seven of us met and after opening up the table, we split into two groups, four playing Alien Frontiers at the far end and three, at the near end, playing Antverpia, a Hamburgum expansion. It’s usually difficult to focus when two games are being taught in close-quarters but being a Hamburgum fan, and having wanted to to play Antverpia for some time, I was able to focus and we got down to making the rondel sing. I can’t say much about Alien Frontiers other than it seemed to progress relatively slowly. I’m not sure if there was a lot of analysis paralysis or turn discussion going on but that was the only game that group got to play the entire night. It took hours! On the other hand, with three, Antverpia moved along nicely. That’s one of the nice features about the rondel mechanism that Mac Gerdts is so fond of. There is really so little down time between turns that the experience borders on a sense of speed chess or something. Several times I would quickly move my pawn on the rondel and was almost beside myself waiting for it to get back around to me. The game accelerates throughout especially when you’re driving towards some goal that will take you several turns to accomplish and you have the sense that others are working towards the same goal. When you see somebody purchase one of the bells…the race is on! I think I may like Antverpia over the base game. The rules are stream-lined, boiled down to just what’s necessary to retain the essence of the game. I own the expansion but have never played my copy but would gladly play it again. Right now for that matter but, as I look around the family room…nobody is within sight. Maybe I’ll crack the shrink on Hawaii and see what the box holds. Thanks for coming guys; I’m looking forward to next month. A few weeks ago, I found myself sitting on the couch on a lazy Saturday afternoon contemplating many of life’s mysteries. Finding no solutions and coming out of my daydream reality, my eyes focused on my game collection. Spilling from shelves and draping from the top of an armoire, the colorful mass holds protected, a dusty triangular box. A box with gaudy artwork that makes one wonder what was going through the minds of those that decided on the final copy. Pulling myself off the couch, I grabbed a chair from the kitchen and standing upon it, dug my way through the stacks of games, pulled out Tal der Konige and blew the dust from the grail game that so captured my desire. Ignoring the box art, Tal der Konige is simply beautiful. The chunky, thickly painted cubes, reminiscent of those in Medina, give the game its stark beauty, accentuating the simple iconography. Beyond its artistic beauty, at its core, lies a game of extreme back stabbing and schadenfreude. To earn points, players are attempting to complete the building of pyramids on locations spread throughout the board. To earn more points, players attempt to build them out of like-colored blocks. Obtaining blocks in sufficient numbers, in the desired colors, at the correct moment is difficult and players may at times earn less points for completing mix-colored pyramids or pyramids with each layer composed of the same colored blocks. But, the pyramids must be completed to earn any points. 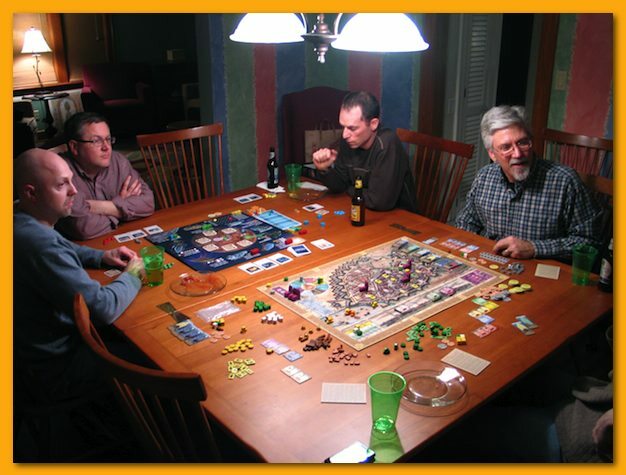 Players move one of two overseer and several builder pawns around the board and allocate them to building sites affording them the ability to add cubes. However, depending on their numbers at a site, other players can invade to steal blocks and, at times, wrestle away control of the partially built pyramid. Piles of randomly drawn blocks are auctioned at the beginning of each round and players blind bid on the lots by dividing up a collection of bid tokens to whatever piles they wish to bid on. Some of the bid tokens have nothing on them so players can bluff what they’re interested in bidding on. Players then secretly determine where their overseers will move by programming in their allotted movement on a wipe-off placard. When everybody is done, the movements are revealed and the overseers are moved in turn order. If a player is unable to move where they expected, due to the programmed move of an earlier player, well, they’re just out of luck. Once builders are moved in turn order, players steal blocks, take over pyramids, and place blocks to complete pyramids or push them closer towards completion. Any blocks not placed in the round, are used to construct the big pyramid in the middle of the board and when that pyramid is complete, the game ends. Points are awarded to players who have completed pyramids and the player with the most points wins. 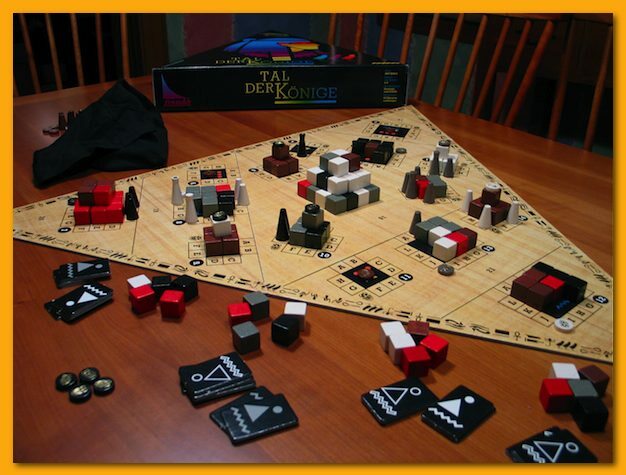 Tal der Könige was my grail game for years. I wanted a copy just to have it in my collection. I’d love to play it with my group but I’m not sure that will happen. We’re very much a “cult of the new” kind of group but maybe I’ll try harder to get it to the table at some point. That said, I’d never trade or sell it. It’s just such a unique and beautifully manufactured game that catches the eye of most anyone that sees it.